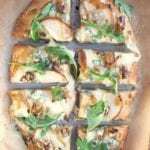 A pizza bursting with juicy pears, tangy blue cheese, toasted walnuts, sweet caramelized onions and peppery arugula. Preheat oven to 350 degrees. Arrange chopped walnuts in a single layer on baking sheet. Toast in oven until slightly brown, about 5-10 minutes. Place pizza stone or pan inside oven and raise temperature to 500 degrees for 30 minutes. Melt butter in a skillet over medium heat. Add diced onions and cook until caramelized, stirring occasionally, about 10-15 minutes. Set aside. Roll both pizza doughs out on a cornmeal surface. Brush with olive oil. Cover the pizza crusts in a layer of mozzarella cheese. Use all the cheese, equally distributing it over both pizzas. Top both pizzas evenly with pears, toasted walnuts, blue cheese, and caramelized onions. Let cool for 5-10 minutes, sprinkle with arugula, cut and serve! *I recommend Naturally Ella's recipe. You’ll need a total of about 2 hours to prepare the crust: 30 minutes to make the dough, 60 minutes for the first rise, and 20 minutes for the second rise.